3P Technologies Boost Stormwater Treatment. 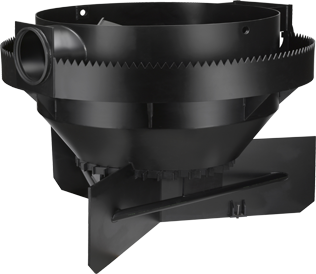 The Hydroshark particle separator removes the filterable substances (TSS) from the rainwater runoff. This protects water and infiltration systems. the incoming storm water is deflected into a radial flow pattern. There, the so-called teacup effect sedimentation of solids takes place. These sink into the underlying sludge trap, which is hydraulically separated from the treatment room by a grate and flow breaker, so a re-dissolution of the sedimented particles during heavy rainfall is impossible. Then the water in the outer ring of the system flows evenly upwards. A balancing weir ensures that there are no short circuit currents in the system and a homogeneous flow prevails. About the balancing weir the water then flows into the drain. Lightweight materials such as oils or pollen are effectively retained because they cannot submerge beneath the separator wall. There is no head loss between inlet and outlet. The system cannot lock. The 3P Hydroshark can be used on all surfaces, from roof areas to traffic areas and industrial areas. 3. 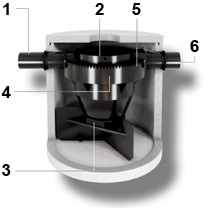 Solids are retained in the sludge chamber below the treatment chamber. Remobilisation of retained solids s not possible, flow baffles and a grill prevent this. 6. clean storm water passes to the outlet to discharge to the water environment.